Of course, there is unanimous agreement that no one should miss the glories of Shakespeare! Teachers and parents recognize that fact, yet are fully aware that Shakespearean works in their original form are simply too formidable for many youngsters. There is an answer to this dilemma- simplification! Yet it must be simplification that is so adroitly and creatively handled that none of Shakespeares beauty and eloquence and humor is lost. Now editors Peggy and Judith Anderson have made it possible for struggling readers to enjoy the works of one of the greatest authors of all time. Their Streamlined Shakespeare has been designed for schools that seek to adapt the traditional curriculum to meet the needs of all students. It can be used remedially in the special education classroom and adaptively for regular education settings. This has been accomplished with a unique format which sets this work apart from all other adaptations: Each play is presented in two parts- a narrative (the story), followed by the play. Often students have a difficult time understanding content presented in a play format. A paucity of description deprives the reader of the story's context, so critical to comprehension. Streamlined Shakespeare's narrative format presents the reader with an opportunity to understand the vagaries and complexities of the plot early on. 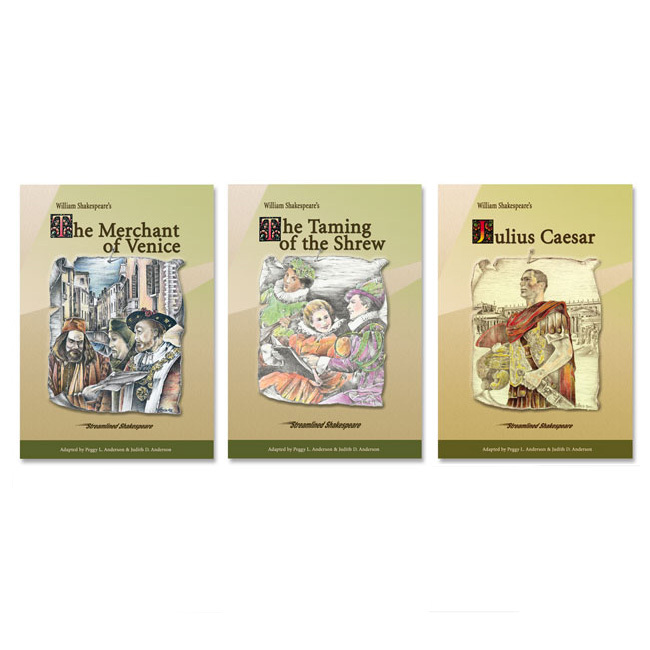 Each play has its own reproducible workbook designed to reinforce vocabulary and to enrich the students comprehension of Shakespeare's heralded works. Answer key included in workbooks. Workbooks are 8 1/2x11, 24 pages.